Sola Switzerland, a cutlery creator and manufacturer, has a rich and interesting history. 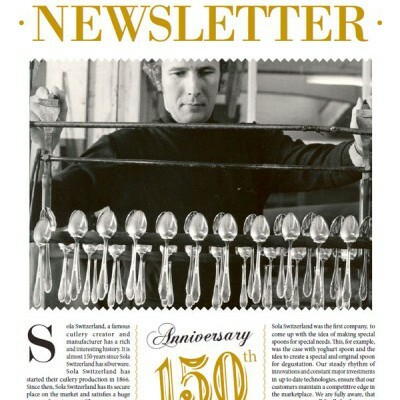 It has been almost 150 years since Sola Switzerland started producing silverware. The company started their cutlery production in 1866. Since then, Sola Switzerland has secure place on the market and satisfies a huge range of customers. The company is constantly developing innovations and is setting standards with new and fresh ideas, thanks to customized design, modern production and a great team of hard-working people. Sola Switzerland would like to thank all of you who rely on the services provided. Our thanks also go to our employees whose first endeavor always is customers’ satisfaction.